A comprehensive case study conducted by the Commonwealth Fund to examine programs that aim to improve outcomes and reduce costs of care for patients with complex needs found that Guided Care® offers a relatively simple, inexpensive care management approach for complex patients. With more health systems taking on financial responsibility for patient outcomes, Guided Care has emerged as a model for effectively managing high-cost patients. 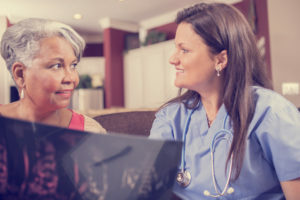 Created by Johns Hopkins University researchers in 2001 and licensed to health care systems, the Guided Care model aims to improve health outcomes and reduce spending by better managing care for the growing number of aging Americans with multiple chronic conditions. The creators of Guided Care sought to strike a balance between telephone-based care management programs, which are relatively inexpensive but ineffective for high-need patients, and operationally complex programs that rely on interdisciplinary care teams. “The Guided Care model is relatively simple and systematized,” says Chad Boult, M.D., who helped develop it while serving as director of Johns Hopkins’ Lipitz Center for Integrated Health Care. Lahey Health—a physician-led nonprofit teaching hospital of Tufts University School of Medicine based in Burlington, Massachusetts—utilized Guided Care to reduce hospital admissions and emergency department visits. According to Lesile Sebba, M.D., Lahey’s chief medical officer, Guided Care “…was our our biggest single intervention, and I do believe it was a major factor in the turnaround”. Guided Care helped Lahey reduce admission rates by 22 percent, and ER visits by 7 percent. Lahey also achieved nearly $22 million in savings between 2014 and 2015, with just under half of those amounts as shared savings. Guided Care® is an efficient, cost-effective way to meet the needs of patients with either chronic illnesses or co-morbidities. By utilizing a team of providers, the Guided Care® model allows for patient-centered, cost-effective care for 50-60 chronically ill patients. To learn how Guided Care® can benefit your hospital or institution, click here.